Oberlin Farm. Image courtesy of Oberlin Farm. 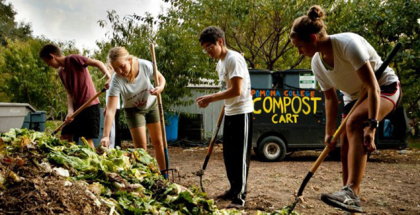 Across the country, sustainable agriculture is growing on college campuses. Carefully nourished soil on old athletic fields and other underutilized areas is becoming darker and richer, and nascent orchards are surviving the trial-and-error pruning of novices to mature and bear fruit. These student-led farms are providing local food, community, and practical agricultural experience to their young caretakers. 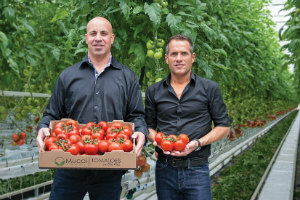 Gianni Mucci (left) and Bert Mucci proudly display Mucci Farm’s hydroponic tomatoes. Shortly after immigrating to Ontario, Canada from Italy in 1961, brothers Tony and Gino Mucci planted their first vegetable crop on rented land. In 1969, they built a wood frame greenhouse, and in 1975, they put four acres of crops under glass—a risky venture during a time of high-mortgage rates, as well as high fuel and labor costs. The investment paid off. 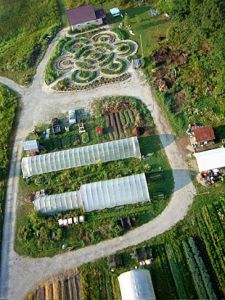 Today, Mucci Farms continues to make investments in its profitable business, especially in the area of sustainability. News Release: LOS ANGELES, CA—DaVinci, Einstein, Howard Hughes, Steve Jobs – each one a visionary whose unique view of life prompted innovations and inventions that – whether in art, science, industry or technology – continue to shape the evolution of our world. 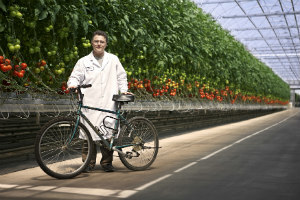 Today, faced with challenges of global warming and water shortages, visionaries in sustainable agriculture are creating unique farming concepts, products, and practices to address the food needs of a growing world population while at the same time developing viable local economic opportunities for entrepreneurs, restaurateurs, and investors. Photo Credit: Green Sky Growers. Traveling from farm to market has never been a shorter trip than it is for the produce grown by Green Sky Growers, a rooftop aquaponic farm, in Winter Gardens, Fla. The farm’s main client is a restaurateur housed in the same building. Delivering fresh produce is a mere one-minute commute in an elevator.